Dr. Ann has been restoring missing teeth with dental implants for over 11 years, and she believes that the key to excellence is continual advancement based on resolute learning. Any long-term patient of Designer Smiles knows that Dr. Ann and Dr. Lauren both attend far more hours of continuing education than is required by their licensure. 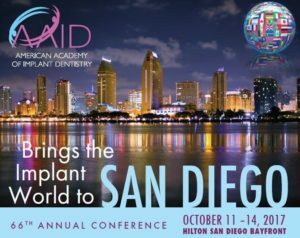 This past weekend, Dr. Ann attended the annual scientific meeting of the American Academy of Implant Dentistry in San Diego. After three and a half days of classes, one thing is crystal clear: implant dentistry is constantly changing. It is becoming more predictable and more successful when used with advanced techniques and technology. One of the latest developments in improved healing with dental implants is the use of platelet-rich fibrin (PRF). PRF is a material derived from a patient’s own blood, which has two great advantages over the most commonly used materials in implant dentistry: 1) It promotes faster healing and decreases risk of graft rejection. 2) It costs less. When you are scheduled with Dr. Ann or Dr. Lauren for a dental implant, on the day of surgery, one of the first steps will be a blood draw. 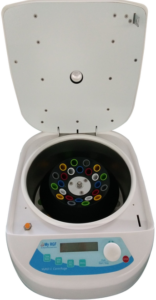 The blood that is taken is spun in a centrifuge so that the PRF can be extracted. PRF comes out in a thick, gelatinous form and contains platelets and growth factors embedded in a fibrin membrane. There are no other chemicals or materials added to the patient’s own blood, so there is no concern about reactions or rejections. Because PRF has a complicated architecture, it provides a wonderful matrix on which healing can occur. Multiple research studies show rapid and accelerated wound healing when PRF is used compared to without it. The use of PRF also decreases the overall cost of your treatment. By using PRF around a dental implant or in an extraction site, Dr. Ann and Dr. Lauren are able to use less of the costly bone grafting materials more commonly used in implant dentistry. In some cases, no expensive membrane is required as PRF can do the job on its own. Dr. Ann and Dr. Lauren are committed to staying on the cutting edge of dentistry and using techniques and technologies proven to provide the highest standard of patient care. Using a natural substance from your own body to give you the fastest, best healing at the lowest cost is one of the many ways we at Designer Smiles continue to do that. Interested in Faster Healing from a Dental Implant? If you are in need of dental surgery and would like to explore the use of PRF to have the most optimal healing, call our office today at 281-667-4010 to schedule a consultation with our doctors. They will create a customized treatment plan to address your specific needs with excellence.